Deviled eggs is a classic and easy appetizer recipe that uses just a few ingredients. The important thing is to make sure the eggs are properly cooked, and that you beat the egg yolk mixture well so it's velvety smooth. Did you know that for best results, you should never hard cook very fresh eggs? Store the eggs in the fridge for about a week and then they will peel more easily since air gets in between the shell and the egg itself. Place the eggs in a large saucepan and cover with cold water. Bring to a boil over high heat. Boil the eggs for 1 minute, then remove from the heat, cover, and let stand for 12 minutes. Place the saucepan in the sink and run cold water over the eggs for 3 to 4 minutes or until they are cool. Gently tap the eggs against the side of the pan while they are still under the water to crack the shells. Let stand for 4 minutes, then carefully peel the eggs. Cut the eggs in half lengthwise. Using a small spoon, scoop out the yolks, and place the yolks in a small bowl. Using the back of a spoon, mash each of the yolks, adding a spoonful of the mayonnaise, until mixture is smooth. Gradually add the rest of the mayonnaise and then the honey mustard, beating until smooth and creamy. Season to taste with salt and pepper. Fill the whites with the egg yolk mixture, cover, and chill for 2 to 3 hours before serving. These eggs last for just a day or two when stored in the refrigerator, but they shouldn't last even that long; people gobble them up. 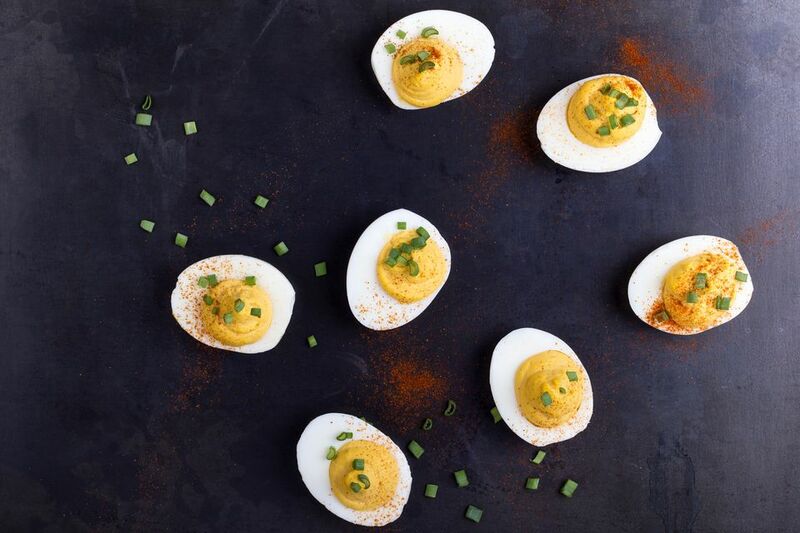 The Creamiest Deviled Eggs You'll Ever Eat!